When you make a recording of a presentation, all its elements (narration, animation, pointer movements, timings, and so on) are saved in the presentation itself. In essence, the presentation becomes a video that your audience can watch in PowerPoint. 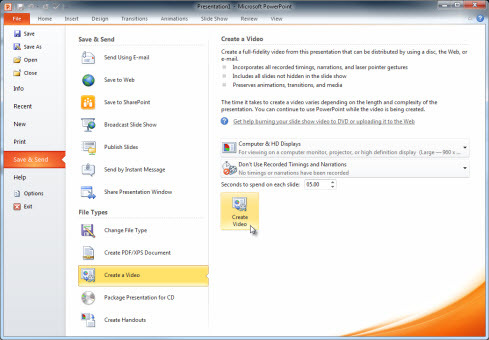 Save/export your presentation to a video file format (.mp4 or .wmv). After you've created your slides and recorded any timing and narrations and laser pointer gestures that you want to include, you're ready to create a video file. On the File menu, select Save to ensure all your recent work has been saved in PowerPoint presentation format (.pptx). * The Ultra HD (4K) option is only available if you're using Windows 10. If you haven't recorded timed narration, by default the value is Don't Use Recorded Timings and Narrations. The default time spent on each slide is 5 seconds. You can change that timing in the Seconds to spend on each slide box. To the right of the box, click the up arrow to increase the duration, or click the down arrow to decrease the duration. If you have recorded a timed narration, by default the value is Use Recorded Timings and Narrations. In the File name box, enter a file name for the video, browse for the folder that will contain this file, and then click Save. In the Save as type box, choose either MPEG-4 Video or Windows Media Video. You can track the progress of the video creation by looking at the status bar at the bottom of your screen. The video creation process can take up to several hours depending on the length of the video and the complexity of the presentation. Tip: For a long video, you can set it up to be created overnight. That way, it’ll be ready for you the following morning. To play your newly-created video, go to the designated folder location, and then double-click the file. When someone opens a PowerPoint Show file, it appears full-screen in Slide Show, rather than it edit mode. The viewer begins watching the presentation immediately. On the File menu, select Save As. Choose the folder location where you want to store your PowerPoint Show file. 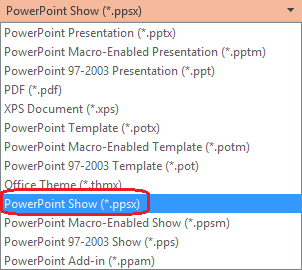 In the Save as type box, choose PowerPoint Show (*.ppsx). Why turn your presentation into a video? When you want to give a high-fidelity version of your presentation to colleagues or customers (either as an e-mail attachment, published to the web, on a CD or DVD), save it and let it play as a video. You can save your presentation as either an MPEG-4 video file (.mp4) or a .wmv file. Both formats are widely supported and can be streamed over the internet. You can record and time voice narration and laser pointer movements in your video. You can control the size of the multimedia file and the quality of your video. You can include animations and transitions in your movie. Viewers do not need to have PowerPoint installed on their computers to watch it. If your presentation contains an embedded video, the video will play correctly without your needing to control it. What parts of a presentation won't be included in a video? Media inserted in previous versions of PowerPoint. To include these, you can convert or upgrade the media object. For example, if you inserted the media using PowerPoint 2007, it will be linked and it will play in the presentation. However, when you export the file as a video, the linked media will be dropped. You can convert the file to the new file format (click the File tab, and under Info, click Convert), or you can right-click the media object and then click to upgrade; it will embed the file and export it correctly. Upload it to your organization's Microsoft Stream video-sharing site, as described in the next section, "Save to a video-sharing site." After you've created the video file, you can upload it to a video-sharing site. Microsoft Stream is an enterprise video service where people in an organization can upload, view, and share videos. Office 365 business or education subscribers have access to this service from within PowerPoint for Office 365. Select File > Export, and then select Publish to Microsoft Stream. Type a title and a description for the video. Click the message to go directly to the video playback page on Microsoft Stream. For more information about this service, begin reading with What is Microsoft Stream? It includes information about Office 365 Video vs. Microsoft Stream. 1 The Ultra HD (4K) option is only available if you're using Windows 10. 2 In PowerPoint 2016, the Ultra HD (4K) option isn't available in the Volume License edition. Click File > Export > Create a Video. PowerPoint 2013 and newer versions can save your presentation as either an MPEG-4 video file (.mp4) or a .wmv file. Both formats are widely supported and can be streamed over the internet. On the File menu, click Save & Send. Under Save & Send, click Create a video. To display all video quality and size options, under Create a video, click the Computer & HD Displays down arrow. If you didn't record and time voice narration and laser pointer movements , click Don't Use Recorded Timings and Narration. The default time spent on each slide is set to 5 seconds. To change that, to the right of Seconds to spend on each slide, click the up arrow to increase, or the down arrow to decrease the seconds. If you recorded and timed narration and pointer movements , click Use Recorded Timings and Narrations.